Many widely popular ideas, initially were so incredibly unpalatable, I think George Bernard Shaw said something like this once. New ideas find mental resistance in our psyche.... well because they go counter to our intuition. It is natural. Drinking blood soup sounds ridiculous and abhorable. Such is the case with pretty much all ideas that initially have no basis in our experience. Prior to 1687 the concept of black swans was as alien as flying cows. However, the reward to those who can see the black swans coming or be ready to accept the possibility, or go further embrace and leverage the black swan can be astronomical. One of the top 5 entrepreneurs of our time, Steve Case, told me of how reluctant people were of AOL when he started. He saw what others did not. We must retrain your brain to deal with possibilities quickly before we miss the opportunity. Beliefs are sticky, don't get glued to them. Most beliefs do not serve us well. Keep good values and dump needless beliefs. 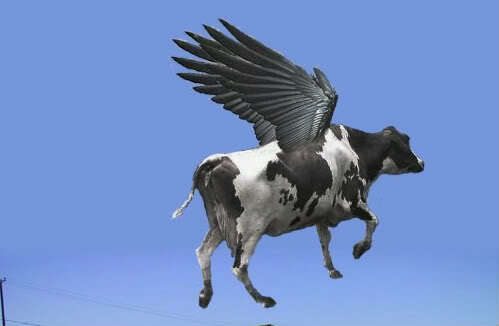 Keep an eye open for the black swans or flying cows. For the sake of inconsistency and training, entertain contrarian ideas in your head as often as you can so that you can develop your creativity and leap at opportunities. Creativity and innovation is at the center of business and personal success. If you are innovative, you can find solutions to almost any problem. Learn to play with possibilities in your mind with any idea. Stretch it beyond its limits to see where it goes. Don't let needless beliefs hold you back from what could be. Comedian are masters of stretching. And they create fun. History is replete with ideas that were met with fierce resistance. Who knows if the world at large had been more open to new ideas, humanity would have progressed and evolved much farther than were we are today. The fundamentals of genetics discovered by Gregor Mendel were ignored for close to a century before being "rediscovered" in the early 20th century to form the foundation of the new field of genetics. When the automobile was invented people were reluctant to travel on it. They thought that riding on an vehicle with an internal combustion engine was like sitting on a ticking bomb that could explode any time. We originally thought we were at the centre of the universe. The church believed in the idea so much that in the early 1600s they burnt Giordano Bruno at the stake and later sentenced Galileo to house arrest for supporting the Copernican theory that the Earth revolved around the sun. Walt Disney was fired from the Kansas City Star in 1919 because, his editor said, he “lacked imagination and had no good ideas. After a performance at Nashville’s Grand Ole Opry, Elvis Presley was told by the concert hall manager that he was better off returning to Memphis and driving trucks (his former career). Socrates was a visionary but at the time he was living, his innovative ideas labeled him an “immoral corrupter of youth” and lead him to his death sentence. Despite this, he persevered until the moment he was forced to poison himself. Women dressing up like men (jeans/t-shirts) or even working alongside men were initially looked down upon but now they are accepted by and large.